Hsueh-Chia Chang, Bayer Professor of Chemical and Biomolecular Engineering at the University of Notre Dame, has been named recipient of the 1st Source Commercialization Award celebrating research that has made it to the marketplace. Chang, who also is an investigator with the University’s Advanced Diagnostics and Therapeutics Initiative (AD&T), is a leading researcher in micro/nanofluidics, particularly in the area of nano-electrokenetics. He was honored for his research that explores and applies electrokenetic phenomena to develop new diagnostic and micro/nanofluidic devices that are portable, sensitive and fast. Devices and techniques under development include DNA/RNA sensing, on-chip pH actuation, Carbon Nanotube /Nanocolloid molecular sensors, nanofluidic diodes, and plasmonic sensors. Three of Chang’s technologies have been licensed to F Cubed LLC, housed in the University’s Hillcrest Hall, and are being integrated into diagnostic devices for environmental, medical and food safety applications. Michael Vogel, an adjunct instructor and entrepreneur in residence in Notre Dame’s Mendoza College of Business, for his outstanding personal commitment to providing sound counseling and advice to dozens of students and start-up organizations. 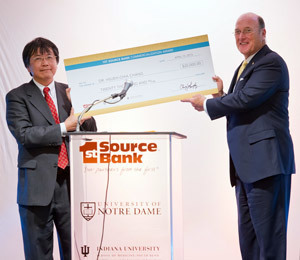 Established in 2010 with a $1 million gift from 1st Source Bank, the award is presented each year to faculty from Notre Dame or the Indiana University School of Medicine-South Bend who have successfully transitioned their technology from the lab to the marketplace. The keynote speaker at this year’s event was Pamela Contag, who is chief executive officer of Cygnet Biofuels and a member of the Merrick & Co. Consultancy. She founded three venture-backed start-up companies: Xenogen Corp., Cobalt Technologies and Cygnet Biofuels, which is developing microbial systems for biofuel production. In addition to the commercialization award, the 1st Source gift funds an annual lecture or symposium on technology commercialization, bringing to campus experienced entrepreneurs and investors, legal experts on company formation and other university technology transfer professionals. Originally published by William G. Gilroy at news.nd.edu on April 19, 2013.